University College Groningen is a Faculty of the University of Groningen, one of the world’s top 100 universities. Our mission is to challenge you, and to give you the space and support to thrive. Our Liberal Arts and Sciences programme is designed to empower you to forge your own path, develop your own identity, and find your position in a constantly changing world. Our Liberal Arts and Sciences programme offers students the opportunity to study a broad range of subjects whilst developing specialist knowledge in their major discipline (Humanities, Sciences, Social Sciences). Throughout the degree students will work in interdisciplinary teams on a series of projects that take them outside of the. This will enable students to learn how to apply a creative approach in finding solutions for complex global challenges. The academic profile of the programme is unique as it is inspired by the three leading societal profiles of the University of Groningen: Energy, Healthy Ageing and Sustainable Society. In this context the programme has a strong emphasis on societal impact. The methodological approach to complex societal challenges is characterised by the perspectives of creating horizon through imagination and creating scholarship and leadership through invention and academic innovation. The emphasis is on orientation and ideas, seeing and identifying problems and imagining solutions, and students learn to provide informed suggestions on how to contribute to the challenges of modern society. Continuous elements are the Skills & Projects line and the research and methodology courses, both of which help you to reflect on and integrate what you learn in the disciplinary subjects. In the second year of the programme you will focus on one of the majors (35 credits), you will participate in an interdisciplinary project (10 credits), and a Research and Methodology programme (15 credits). Within each major, Major Specialisations allow students to combine different academic disciplines or perspectives into a tailor-made programme that fits their interests and prospective Master choice. Please note that alternative specialisations within majors are possible and can be created by the students to fit their needs. 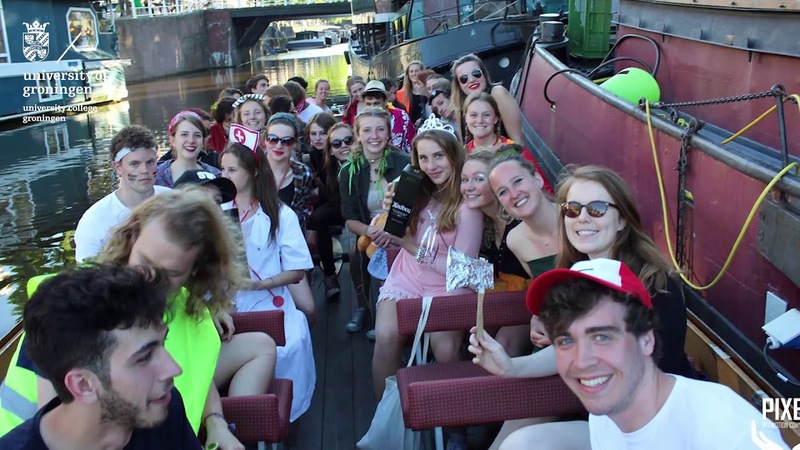 In your third and final year, you will gain some international experience, which could include study abroad (30 credits) or a University of Groningen minor. On top of this you will complete your major specialisation (15 credits), Bachelor thesis (10 credits) and a capstone project (5 credits). The first year consists of 30 required credits in Exploring Challenges, Research & Methodology, Skills & Projects and Academic Writing. The other 30 credits are up to the student: courses can be chosen from a wide variety of topics and disciplines, ranging from physics to psychology and everything in between. After the first year, students are able to choose their major orientation and specialise in a particular academic field. The academic core runs through all three years of the programme. The scope of this specialisation ranges from cell biology to human physiology, immunology, microbiology, neurobiology and important areas in human biology and their relevance for health and disease. Non-medical/biological perspectives on these topics are important to UCG, which encourages multidisciplinary approaches to problem solving, and these perspectives are part of the specialisation whenever appropriate. Students study the topics in this specialisation through small group lectures, working groups, journal clubs, laboratory practicals and self-study. Smart technologies are changing our life and our societies on a deeper level than ever before. Smart home assistants, vehicles, factories, banks, buildings and many more are highly interconnected, communicate with their environment and with us, and operate using various levels of artificial intelligence. To shape the future, we need creative and interdisciplinary minds with knowledge of science, technology and computer science to develop, implement smart technological solutions in our modern society. Students receive training at the intersection of machine learning, psychology, and philosophy, in order to fully engage with the challenging and rapidly growing field of artificial intelligence. Online assistants, targeted advertisements, self-driving cars and smart robots are just a few examples of automated systems that rely heavily on artificial intelligence. At UCG, we believe that, to fully understand how such systems engage with people and influence our society, we must go beyond the traditional core algorithmic focus. Students in this specialisation dive into the heart of all human activity: the psychology of how we think, feel, and behave. The complexity of mind and behaviour requires that students travel back and forth through the micro-scale dimensions of the individual and the macro-scale dimensions of culture. In doing so, students address questions such as: How and why do we filter incoming information to understand the world around us? How do our identities, personalities, and abilities emerge across our lifespan? What role do societal norms play in the increasing prevalence of depression and anxiety? Societies and Cultures in Transition is geared towards understanding current societal and cultural changes. Change often leads to uncertainty, tension, and conflict. Yet, fundamental changes may be necessary to adapt our societies to the world of today and the challenges of tomorrow. Typical questions related to this specialisation are: Can societal changes be explained from the intentions of individuals? What is the role of culture in diverse societies? What are the societal consequences of economic and technological developments? How can we design effective policies to guide societal and cultural changes? This specialisation studies the structure, and the philosophical and economic principles of today's (global) society. The study addresses various societal problems such as the polarisation of society, sustainable economic development, democracy and immigration. These problems have important economic dimensions, and present ethical dilemmas. They also require effective political solutions. The specialisation focuses on the nation state, the market and individual behaviour, and discusses how entities interact. Combing philosophy, politics and economics gives students a multidisciplinary framework to analyse and address global challenges in a sustainable and evidence-based way. This specialisation studies the role of the state and international organisations within the international community. It addresses global societal problems such as armed conflicts, human rights violations, terrorism, migration and climate change. This specialisation studies how states interact with each other, how they balance their national interests and global needs and it studies what the role of international law is. It aims to find means by which international political leaders can come to effective policymaking on the international level. The focus of this specialisation is on international business and entrepreneurship. It aims to understand the global business strategy and analyses how international business and multinationals strategically operate in the global market. It discusses the implications of their strategies and addresses ethical dilemmas. Special attention is also given to the principles of entrepreneurship and the role of entrepreneurship in society. We encourage our students to study their minor (30 EC) abroad in the 1st semester of year 3. If you do not meet the requirements listed above, one of the following tests will provide proof of English proficiency: IELTS (Academic), TOEFL (IBT, CBT or PBT), Cambridge English or the English Language Test offered by the University of Groningen Language Centre. What sparks your interest in the interdisciplinary approach of UCG's Liberal Arts and Sciences programme and what do you believe is the added value of studying multiple disciplines together? Give concrete examples and/or use your own personal experiences. Which UCG major(s) or major specialisation(s) are you interested in, and why? What makes studying in an international and intercultural student community attractive to you and what would you like to gain from this? Give concrete examples and/or use your own personal experiences. How do you see Liberal Arts and Sciences skills, for instance project-management skills, contributing to your future career success? Give concrete examples. (If relevant) explain any shortcomings in the preferred admission requirements. If you have a deficiency in some particular area, explain how this is compensated by other qualifications. The word limit of the personal statement is 500 words. Should you wish to make a video, the maximum duration is 5 minutes. Prospective students can request a meeting to discuss their choice of degree programme. 1 - Apply via Studielink and OAS (Online Application System) You need to submit your personal information, details of your prior education, and your personal statement. Course VWO Mathematics A (e.g. probability, statistics, calculus) or Mathematics B (e.g. differentiation, integration, trigonometry, geometry) offered in Dutch and English at the Boswell-Beta institute in Utrecht (the Netherlands) throughout the year and during the summer months; Dutch VWO Wiskunde A or Wiskunde B certificate (Dutch pre-university Mathematics A or B), obtained at: CCVX (http://www.ccvx.nl/); AP Calculus AB or BC with a College Board examination; AS-level or A-level certificate in Mathematics (via one of the British A-level examination boards); IB certificate Mathematics Standard Level or Higher Level. What sparks your interest in the interdisciplinary approach of UCG's Liberal Arts and Sciences programme and what do you believe is the added value of studying multiple disciplines together? Give concrete examples and/or use your own personal experiences. Which UCG major(s) or major specialisation(s) are you interested in, and why? What makes studying in an international and intercultural student community attractive to you and what would you like to gain from this? Give concrete examples and/or use your own personal experiences. How do you see Liberal Arts and Sciences skills, for instance project-management skills, contributing to your future career success? Give concrete examples. (If relevant) explain any shortcomings in the preferred admission requirements. If you have a deficiency in some particular area, explain how this is compensated by other qualifications. In Projects, UCG students collaborate with experts to tackle real-world issues. In this environment, UCG students learn to work with each other, and draw from the knowledge of multiple academic fields. This is unlike the training offered in other degree programme. Our graduates are provided an excellent foundation from which to pursue further education or enter the workforce. Graduates’ choice of specialisation determines which masters programmes to which they can apply. Our students are guided in these decisions by assigned academic staff. At UCG, students can fulfil most subject requirements for further study. However, some vocational programmes, such as law or clinical psychology, are likely to have additional requirements. Furthermore, strong marketplace interest in Liberal Arts and Sciences graduates makes our students highly sought-after by employers around the globe. Our world is changing in such a way that new situations, uncertainties, and problems emerge constantly. At UCG, we want to prepare you with the skills that allow you to adapt to an ever-changing professional market. We want you to be able to deal with a complex and changing world in ethical and effective ways. This requires an interdisciplinary, creative, and - above all - adaptive attitude and skill-set. Our students are curious, ambitious and interested in a variety of different subjects. Liberal Arts and Sciences at UCG is a demanding programme. Students are expected to be highly motivated. Additionally, one of the main characteristics of the programme is the emphasis on the learning community. It is of importance that students as a class stay together over the years. Students are expected to collect all 60 credits for the first year of the programme within the first year. Students meet their personal tutors frequently, to discuss the progress in academic work and to receive feedback on the assignments that have been made. Furthermore, students receive advice about their study programme from their tutors and other teaching staff. All members of the teaching staff are available to give students advice on their programme and career paths. A study counsellor is available to students for any practical or personal advice related to their studies.